Last week, Kirstie Clements wrote an article in The Guardian lamenting the lack of skirts and dresses that sit at knee length or below. The problem is the length of the dress. Too many, both high street and designer, are just too short. Every single woman I know shares the same sense of frustration, and it’s time we turned to designers and demand to know why we aren’t being offered those few extra centimetres of fabric. 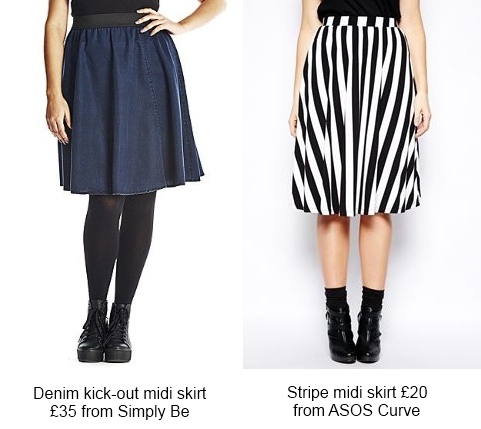 Luckily it seems that this season, for every LovedRobe Military Style Dress or ASOS Curve Skater Skirt that features a skirt length not seen since the days you sulked your way through a freezing cold winter afternoon on the netball court, there are at least some more sensible lengths around. And they aren’t even the dreaded bodycon midi tube skirts of lycra hell either! (Let’s just say I’m not the world’s biggest fan of any style that practically has big flashing arrows showing the innocent passerby exactly where my post-baby and Quality Street tummy is shown in all its glory). I know, I know. I seem to have an enduring fascination with black and white together. But it’s not just me! Fashion retailers will keep using one of my favourite colour combinations while updating the shape, so I just can’t help myself. This slightly longer length dress has a nice 70s feel, but if you’re wide hipped, be aware that Anna Scholz items tend to come up small on the hips so you may want to size up. Even though dresses have been around in a variety of shapes and styles over the past few years, I haven’t found the same variety, or wearability with skirts, where the options have been largely limited to pencil skirts (not great for pear shapes with a tummy), voluminous maxi skirts (not great if you trip over your own feet as it is without any extra help from your clothing!) or bum-skimming skater skirts that threaten to vanish at the smallest breath of wind (I live close enough to the Bristol Channel to make this a pretty permanent stumbling block to skater skirts and sleek groomed hairstyles!) Luckily at the moment there seem to be quite a few, what I’d call “Cycling Friendly” skirts around. Knee length or just below, with enough room for you to walk properly, rather than just teeter along half heartedly. This is a new style we haven’t seen for a while that might make an interesting alternative for those who prefer not to outline everything in a pencil skirt. I’ve not tried this style on yet, so not quite sure whether it will be flattering or frumpy. My first instinct is to ignore the Simply Be advice to wear with baggy varsity sweats and try something like a fitted 50s style animal print cardi instead, but we’ll see. I know the boldness of the print will be offputting for some, but I think it’s a great way to shatter any preconceptions of high waisted voluminous skirts being the preserve of your maiden aunt. This could be quite a good option for that awkward fashion stage where you don’t want to dress like a 17 year old anymore, but aren’t ready to fully embrace the world of Windsmoor conservative separates either. As you might expect, there generally seems to be a wider selection of longer skirt lengths at designer plus size stockists such as Navabi and Slink Boutique. Possibly this reflects the typically older age range of clientele who are happy to spend hundreds of pounds on an investment piece, I’m not sure. But there are still some great bargains to be had. For a slightly younger, more fashion forward style, look out for brands like Igigi, Yoek, MAT and Kiyonna, especially in the sales when you can pick up pieces at a big discount. A great option for work, or smart casual eveningwear, this dress is also available in a peach/orange/coral colour scheme. Knee length with a bra-friendly boat neck. 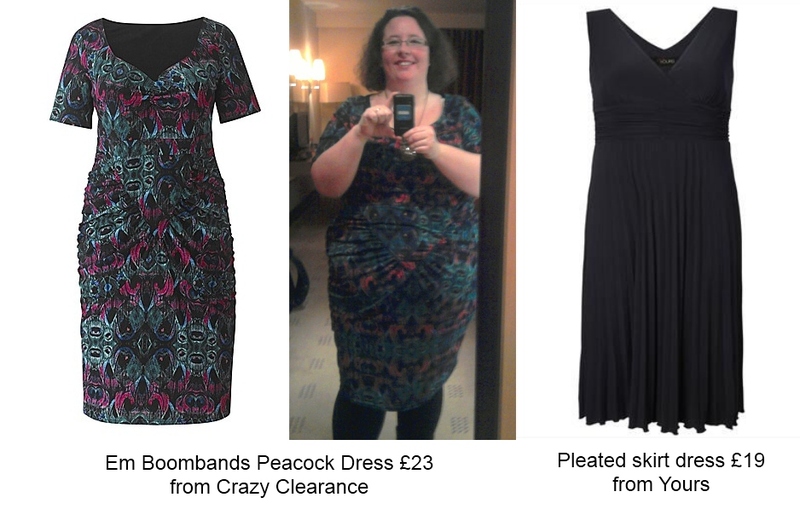 Expensive but definitely an investment piece – I love Igigi! This dress also comes in a red tonal colourway which would make a fabulous Valentine’s outfit. This season, I’d say the party and eveningwear sector has been the worst offender in terms of tempting you with beautiful dresses with sparkle or in luxuriously tactile fabrics like velvet, only for you to discover on trying them on that some of them are more like tunics than actual dresses. Luckily, there are a few outfits that are safe to wear even without tights so opaque they might as well be leggings. I cannot tell you how much I love this dress designed by Em from The Boombands Blog – I mean, I was even brave enough to take a photo of myself in it last week, just before wearing it to a murder mystery dinner at Crewe Hall! It’s an absolute joy to wear – so comfy but looks really special and the clever ruching is really flattering across the tummy. (Oh and in case you’re wondering about the hair… it was an ill fated experiment with a hairdryer and a can of hair mousse. Now I remember why I usually stick to letting it dry naturally – to avoid that 80s T’Pau look!) By the way, you might want to grab this while you can, as I have a feeling that peacock print is going to be massive in 2014. You heard it here first. Ok I know this doesn’t look like much in the picture, but trust me, this dress is A-MAZ-ING! The pleating in the skirt is quite Marilyn Monroe-ish and the flare balances out the length really well (comes somewhere between just over the knee and mid calf depending on how tall you are). I should also point out that there’s a bit of a v neckline at the back, but it’s still high enough to be very bra-friendly. I wore this to an awards dinner and felt like a million dollars; it feels slinky rather than restrictive so can easily stand up to a long night of revelry. The only thing that I would possibly change about it would be to add a lining as it’s made of synthetic fabric, and so when I took if off at the end of the night, it was static city! But for £19, you really can’t complain.